The first emotional bonds of your baby are built from sheer touches. These small yet significant physical contacts will serve as a foundation stone for his/her emotional and intellectual development in the future. Niconi Conditioning Hair Oil for Babies will help you to give your little one a loving bath time massage while stimulating his/her senses through your gentle touch. 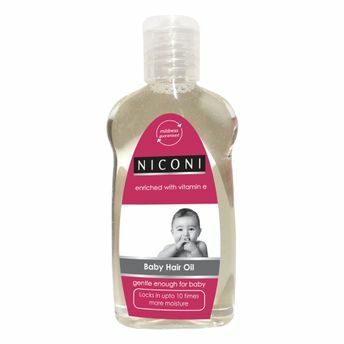 Developed especially for your baby's delicate hair and scalp, this oil is light and non-greasy and is enriched with vitamin E. It will make your baby's hair healthy and soft.